An affiliate program is an internet based distribution solution, which connects advertisers (merchants) and website owners (affiliates or publisher). The special on this model is that the billing is performance-based. Affiliate Networks that host the affiliate programs track the clicks, leads or sales and offer the platform where the publisher gets payed. Niche market. It is not possbile to sell everything to everyone. This is the quickest way to fail in the adventure. Locate niche partners. When the niche market is claimed partners have to be found. Websites or contacts are needed that provide the advertiser with the relevant focus group or segment. The goal is to find partners that have already built traffic and would benefit from the affiliate offer. Promotional Material. The advertiser should provide the affiliate partners with creative and promotional material. The less work they have to do and the more conversions they see the more likely they are to promote the products or services. Take care of the partners. Communicating with the partners like sending out updates on product additions or changes and giving them tips and advise on how to be successful in marketing the own products is very important. The Affiliate is receiving a commission of the merchant (Amazon) on every purchase the customer does once clicking on the link. Kester, Manuel. 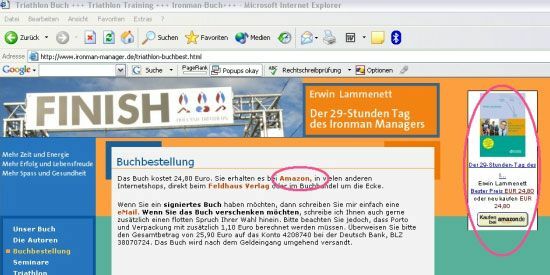 Affiliate-marketing Für B2c-Online-Shops: Grundlagen, Methoden Und Ausprägungen in Der Praxis. Norderstedt: Books on Demand, 2006. Print. Lammenett, Erwin. Praxiswissen Online-Marketing: Affiliate- Und E-Mail-Marketing, Keyword-Advertising, Online-Werbung, Suchmaschinen-Optimierung. Wiesbaden: Gabler, 2006. Print.